German physicist payload specialist astronaut 1987-1993. Status: Inactive; Active 1987-1993. Born: 1954-02-09. Spaceflights: 1 . Total time in space: 9.99 days. Birth Place: Iserlohn. EDUCATION AND: 1972 Graduation from the Maerkisches Gymnasium (High School) in Iserlohn. 1980 Diploma in Physics from the University of Cologne. 1985 Doctorate in the field of Solid State Physics at the University at Cologne. Chosen as a German Science Astronaut in 1987. Assigned to the German D-2 mission in 1990. From 1990 - 1992 underwent D-2 mission Payload Specialist training in Houston, Texas. Flew aboard the STS-55 D-2 mission on April 26 - May 6, 1993 as Payload Specialist PS1. From 1994 Project Manager "German Satellite Data Archive" at DLR. PUBLICATIONS: More than 40 different scientific publications. A book about his spaceflight was published in 1997. PERSONAL DATA: Born February 9, 1954, in Iserlohn, Germany. Married. Two children. He enjoys sports, such as badminton, basketball, and soccer, as well as pop and classical music, electronics (analog, digital, and HF), and photography. ORGANIZATIONS: Member, German Physical Society. PUBLICATIONS: Dr. Walter has some 35 publications in various international scientific journals. Author of two "Bericht der KFA Jlich" (Reports of the National Research Laboratory at Julich, Germany). SPECIAL HONORS: A research fellowship at the University of California at Berkeley by the Deutsche Physikalische Gesellschaft (German Physical Society), 1986-1987. RESEARCH ACTIVITIES: Physical Science in the fields of Neutron Scattering Techniques, Rare Earth Magnetism, High-Tc Superconductivity, and ScanningTunneling Microscopy. 1964-1972 Mrkisches Gymnasium (secondary school) in Iserlohn. 1974-1980 Studying Physics at the University at Cologne. 1980 Diploma in Experimental Physics. (Special Field: Crystal Field Effects in metallic systems. 1972-1973 Served as a volunteer with the German Federal Armed Forces. 1973-1974 Lieutenant and instructor at the Army Air-Defense School, Rendsburg, Germany. 1980-1985 Member of the academic staff at the University of Cologne in the field of Solid State Physics. 1985 Doctoral Thesis at the University of Cologne in the field of Solid State Physics. 1985-1986 Post-doctoral position at Argonne National Laboratory, Chicago, Illinois. 1986-1987 Post-doctoral position at the University of California at Berkley, California. Aug 1987 Nominated as a German Science Astronaut. 1988-90 Basic Astronaut Training at DLR. Sep 1990 Assignment to the German D-2 Mission. 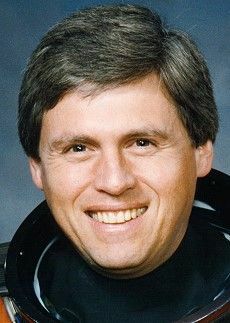 SPACE FLIGHT EXPERIENCE: Dr. Walter flew as prime payload specialist PS-1 on STS-55 Columbia (April 26 to May 6, 1993). STS-55 was launched from Kennedy Space Center, Florida, and returned to land at Edwards Air Force Base, California. Nearly 90 experiments were conducted during this German-sponsored Spacelab D-2 mission to investigate life sciences, materials sciences, physics, robotics, astronomy and the Earth and its atmosphere. STS-55 also flew the Shuttle Amateur Radio Experiment (SAREX) making contact with students in 14 schools around the world. At mission conclusion, Dr. Walter had traveled over 4.1 million miles in 160 Earth orbits, and logged over 239 hours in space. Family: Astronaut. Country: Germany. Flights: STS-55. Projects: STS. Agency: DLR. Bibliography: 6179. 1954 February 9 - . Birth of Dr Ulrich Hans Walter - . Nation: Germany. Related Persons: Walter. German physicist payload specialist astronaut 1987-1993. 1 spaceflight, 10.0 days in space. Flew to orbit on STS-55 (1993)..
1993 April 26 - . 14:50 GMT - . Launch Site: Cape Canaveral. Launch Complex: Cape Canaveral LC39A. Launch Platform: MLP3. LV Family: Shuttle. Launch Vehicle: Space Shuttle. STS-55 - . Call Sign: Columbia. Crew: Harris, Henricks, Nagel, Precourt, Ross, Schlegel, Walter. Payload: Columbia F14/USS/Spacelab D-2 LM. Mass: 12,185 kg (26,863 lb). Nation: USA. Related Persons: Harris, Henricks, Nagel, Precourt, Ross, Schlegel, Walter. Agency: NASA Houston. Program: STS. Class: Manned. Type: Manned spaceplane. Flight: STS-55. Spacecraft Bus: Shuttle. Spacecraft: Columbia. Duration: 9.99 days. Decay Date: 1993-05-06 . USAF Sat Cat: 22640 . COSPAR: 1993-027A. Apogee: 312 km (193 mi). Perigee: 304 km (188 mi). Inclination: 28.50 deg. Period: 90.70 min. Manned seven crew. Carried German Spacelab-D2. Payloads: Spacelab D-2 with long module, unique support structure (USS), and Reaction Kinetics in Glass Melts (RKGM) getaway special, Shuttle Amateur Radio Experiment (SAREX) II..
1993 May 5 - . Landing of STS-55 - . Return Crew: Harris, Henricks, Nagel, Precourt, Ross, Schlegel, Walter. Nation: USA. Related Persons: Harris, Henricks, Nagel, Precourt, Ross, Schlegel, Walter. Program: Spacelab. Flight: STS-55. STS-55 landed at 14:29 GMT. .